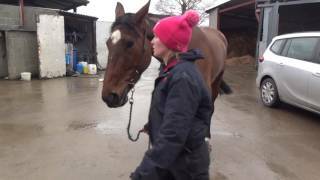 Paul Nicholls has always maintained that Posh Trish is a star steeplechaser in the making but has delayed her fencing debut because her progress over hurdles has been so marked. She won the Listed Mares' Hurdle at Newbury, making all the running and putting a quality field to the sword. She followed up with a facile victory at Wincanton on Boxing Day, making all and running out a very convincing winner. She won that race without over exerting herself which persuaded Paul Nicholls to send her to Taunton for a listed Mares contest, where once again she dominated and fought off a strong challenge about two furlongs from home after which she pulled clear to finish strongly. She had a break before running at the Cheltenham Festival in the Dawn Run Mars’s race and looked certain to be competitive. She was a bit outbpaced and made her only mistake at the last to finish eighth. This was a highly competitive contest in which our mare performed with great credit, but it looks as if she will benefit from stepping up to three miles when she goes chasing next season.